Many of our major holidays have one or more flowers associated with them. Christmas has poinsettias, Thanksgiving, mums, Valentine's Day, roses. Cynics might say that some of these flower/holiday pairings aren't intuitive, but the result of clever marketing campaigns by the floral industry. The flower associated with Easter is different. The trumpet lily (Lilium longiflorum) has been a symbol of Easter, Jesus Christ, and the resurrection for centuries. 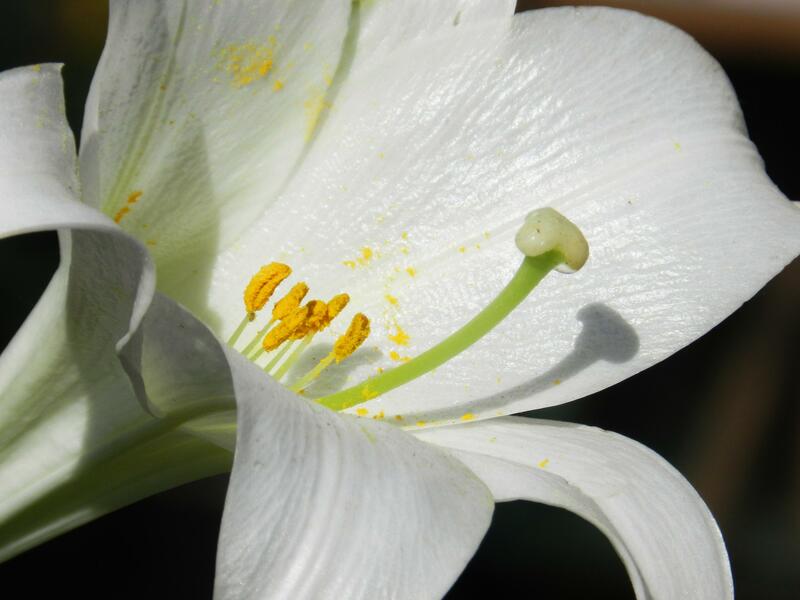 In Christian traditions, the Easter lily represents rebirth and redemption. Its trumpet-shaped blooms appear to be proclaiming the risen Lord. The dazzling white flowers represent purity and light after months of cold and darkness. And these lilies announce themselves with a heady fragrance, a reminder of the richness of life. Florists couldn't have invented a more perfect plant to celebrate Easter if they had tried. Lilium longiflorum are native to Japan. After WWI, an enterprising U.S. soldier brought some bulbs to his home in the Pacific Northwest. WWII stopped the supply of bulbs from Japan, once the largest provider of lily bulbs in the world. That's how a small area straddling Oregon and California, where conditions are perfect for their growth, has become the place where 95% of the world's Easter lilies start. Lily bulbs take three to four years to mature. They are timed to bloom at a moving target, because Easter falls on the Sunday after first full moon after the vernal equinox, which can be any time between late March and late April. As the moon moves, so does the date of Easter Sunday. So growers follow the moon. 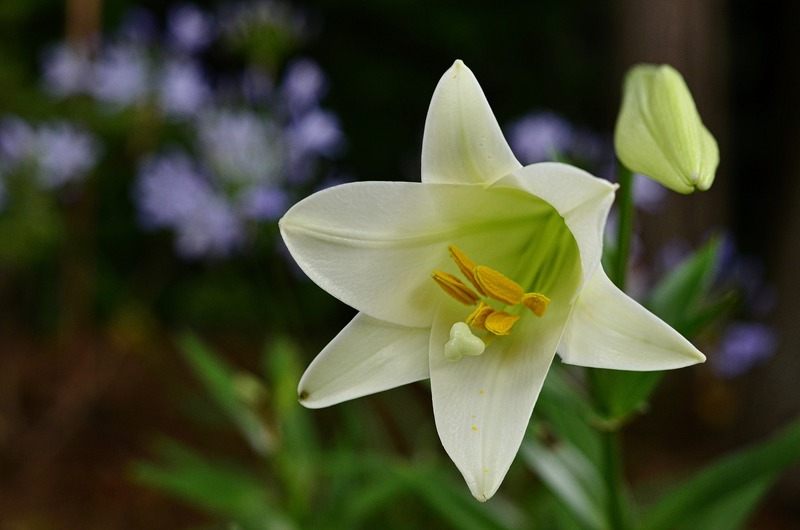 When you buy your Easter lily, look for a sturdy plant, not too tall or floppy, with bright green leaves. For the longest period of enjoyment, buy a plant that has one or two open flowers, and lots of plump buds that will open in successive days. Cut the anthers off the flowers, so the yellow pollen doesn't stain the flower or other surfaces. Lilies don't like soggy soil, so take the plastic or foil sleeve off the pot so water doesn't collect at the bottom. Keep the plant in bright, but not direct, light and cool – under 70 degrees – temperatures. As the flowers fade, trim them off. The lilies you buy at the florist or supermarket have spent their lives indoors; they've been fed and groomed to give all they have in one glorious blast. That said, if you've given them good care inside, you can plant them outdoors after blooming. They won't rebloom that summer, but with rich, moist, well-draining soil, regular feeding with an organic fertilizer, and lots of sun, your Easter lily will trumpet its message of hope and renewal next summer and for years to come. Note: Every part of a lily, including the pollen, is poisonous to cats. Even a little taste can harm kidney function, and can be fatal. Lilies are not recommended in homes with cats. Easter Lilies, Their Care and Feeding has more information on growing Easter lilies.